CARFAX 1-Owner, ONLY 52,000 Miles! PRICED TO MOVE $2,000 below NADA Retail! 3rd Row Seat, DVD Entertainment System, Heated Leather Seats, Navigation, AUDIO SYSTEM, 8" DIAGONAL COLOR TOUCH SCREEN NAVIGATION WITH INTELLILINK CLICK NOW! PREMIUM PACKAGE includes (UV6) Head Up Display, (BRS) power-retractable assist steps and (Y66) Adaptive Cruise Control with Front Automatic Braking, LPO, 22" 6-SPOKE CHROME WHEELS LPO wheels will come with 4 steel 22" wheels from the factory with alignment specs set to 22" LPO wheel selected (dealer-installed), OPEN ROAD PACKAGE includes additional 9 months of SiriusXM Radio and NavTraffic service, (CF5) power sunroof, (U42) rear seat entertainment system and on SLT (IO6) Audio system with navigation, ENTERTAINMENT SYSTEM, REAR SEAT BLU-RAY/DVD. with remote control, overhead display, four 2-channel wireless infrared headphones and auxiliary audio/video input jacks/SD and USB slots, includes second screen for third row passengers, AUDIO SYSTEM Onboard Communications System, Remote Trunk Release, Keyless Entry, Steering Wheel Controls, Electronic Stability Control, Heated Mirrors, Adjustable Pedals. 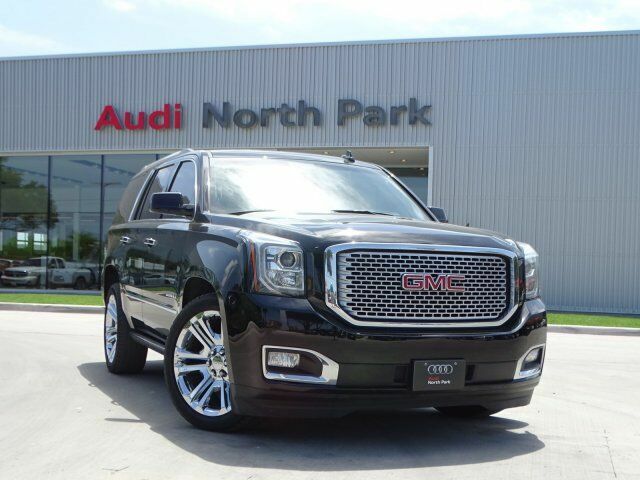 This Yukon Denali is priced $2,000 below NADA Retail.